Price: $2.99 – Buy Now! A wolf in sheep’s clothing is sometimes more than just a turn of phrase. Sheep vs wolves and only your assistance can bring peace back to the farmland. In operation “Iron Wool” you must assist any sheep towards the ground, while eliminating any potential threats. As with most puzzle games, the story of the game only serves to lay the framework for the gameplay. The story is that the owner of peaceful sheep has had to venture off to serve his country in war, and in his absence the wolves have begun to advance upon the peaceful lands in which the sheep graze. 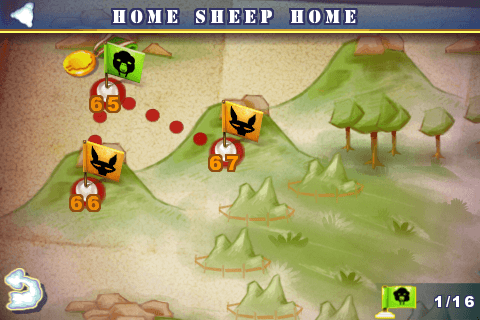 Thus to defend their home from the wolves, the sheep devise a cunning strategy of an airborne assault to claim back the land which has been occupied by the wolves. The levels themselves are great to see, will full cartoonish style and flare. The sheep and the sheep-clothed wolves are well drawn and are interesting enough when they turn into a pentagonal shape. However there is much to behold happening both in the foreground and the background. 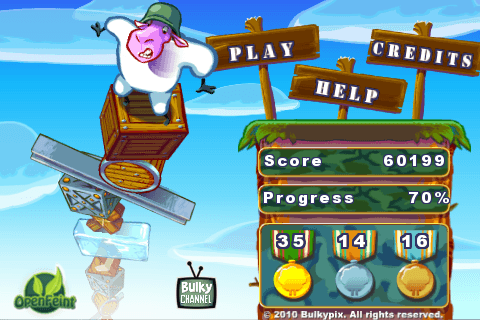 In the background while you are playing, you may see an UFO suddenly fly across the screen and abduct a random cow. Either that or you may even see more of your fellow para-sheep being landed in other areas outside of your own. Not only this, but in the foreground you can sometimes see a wolf’s head pop up and sneer, waiting for the mutton meal above. Though these features do not add anything gameplay wise to the game itself, they are entirely welcome as it provides the feeling that there is more going on, as well as provide laughs, such as a wolf appearing right when the poor sheep falls to it’s clutches. The goal of every single level is to make any sheep shown in the area to land and stay on solid ground while forcing any disguised wolves into the abyss below. Your assistance is necessary to bring these sheep to the land, by shooting and destroying any obstacles which are holding said sheep from their destination. Once the sheep reaches the ground a few seconds will pass and the sheep will unwrap himself from his fleece container and be ready to advance on. There is a minor issue with this however, due to the fact that occasionally the sheep will begin to come out and allow the level to be over, before it is securely on the platform. On a number of occasions the level continued fine even though the sheep fell off into the abyss. There are four different types of obstacles which will impede your progress. 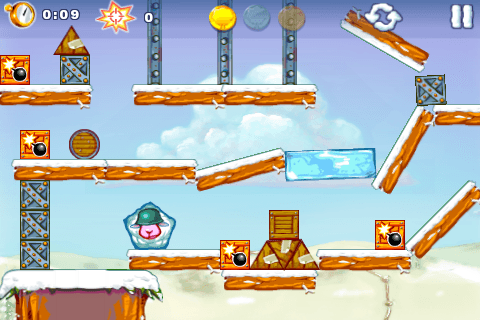 There are wooden blocks which will be destroyed in only one shot; ice blocks which take two shots but can break under impact; explosive boxes which will cause extreme forces to shove anything out of the way; and finally heavy steel blocks that are indestructible and difficult to move even with explosive boxes. There are currently over eighty different levels, and the difficulty does increase over time. There is also a small side area occasionally which is not needed to progress, but introduces a level of higher difficulty earlier on in the game. Here however is where there is a negative. The game itself is enjoyable, however after a period of time most of the levels begin to look the same, even if there is a different way always to solve the puzzle, many times the level will appear with nearly the exact same set up, except with a variation of boxes added together to make it appear different. 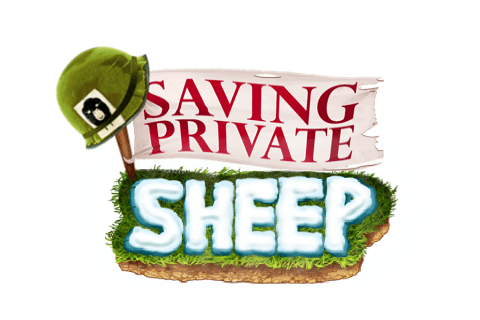 Saving Private Sheep is a very enjoyable puzzle game with an interesting twist on the whole sheep vs wolf story. There are some minor hiccups and issues, however nothing that truly takes away from the core gameplay. The game is entirely perfect for either a long time session, or even just a short five minute stop in.